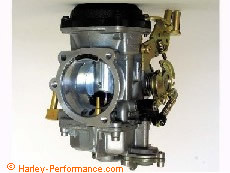 Harley CV carburetors are the finest carbs ever used by the factory, however due to emission regulations these carburetors are greatly restricted in their ability to perform. You twist on the throttle giving it all your Harley has to give. Your bike coughs, surges, and finally gets up to speed, all while getting passed by the pack! Most riders with stock carburetors know this feeling all too well. Your first instinct may be to install an aftermarket carburetor. Unfortunately most aftermarket carburetors have two major drawbacks, cost and lack of driveability. It may come as a surprise to many that your Harley already has a performance carburetor, but it simply lacks the tuning required to perform. Overcoming your carburetor’s restrictions through proper tuning will unleash the beast within, and no longer will you be left in the dust! Experiencing your Harley’s full potential can be as simple as installing a Stage 1 tuners kit. The Harley-Performance Stage 1 Kit by CV Performance was developed based on 20+ years of tuning experience meeting the needs of real world riders. High performance without the high aftermarket cost! CV Performance Stage 1 Carb Kits include quality American Made parts and are available for all Harley models from 1989 to present that use a CV style carburetor. Kit includes complete installation and tuning instructions. CVP Velocity Emulsion Tube • Designed to deliver a vortex spray pattern for optimal fuel atomization.• Precision CNC Machined• Exclusive design, only available from CV Performance. • Accepts both CVP and OEM main jets..
Special - Free Stainless Steel Bowl Screw Kit! Your Harley will perform at it’s peak without compromising driveability. Faster warm ups, smoother response, steady idle characteristics, and reduced “coughs” or hesitation compared to any stock set up. Wake up your engine’s potential and feel the hidden performance within your Harley. Also a great way to renew any Harley carburetor that has been neglected or incorrectly jetted. Combined with any exhaust and air cleaner upgrade, modification of your Harley’s carburetor is a must to achieving a true Stage 1 upgrade. Unlike race kits which require expensive dyno tuning or installation of odd hybrid parts, the Stage 1 Carb Tuner Kits from CV Performance utilize your carburetor’s built-in tuning capabilities. 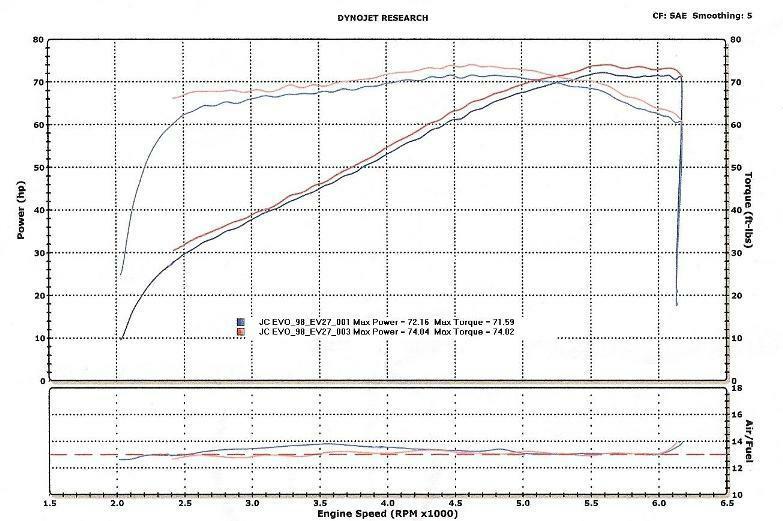 View a Dyno run performed after installing the Tuners Kit. The included installation and tuning instructions walk you through the process taking the mystery out of carburetor tuning. The kit contains all the parts required for both stock and modified engines. Before you know it you will be ready to ride. All for less cost and time of a visit to your local dealer, and far less than the cost of a new aftermarket carburetor. The Complete Kit is also available in a Deluxe version by adding the EZ-Just mixture screw, while the Basic Kit is offered for those requiring a more basic rejet. Customer comment: After multiple trips to the dealer to tune my Harley, it still never ran the way it should. The dealer even sold me a kit but that only made things worse. Once I installed your stage 1 kit my Harley ran better than new. What a difference the right parts made.Thanks again! Jason – Kansas City, Mo. Includes a free Stainless Steel Screw Kit as a bonus! CV Performance to better serve all customers. Special – Free Stainless Steel Bowl Screw Kit!